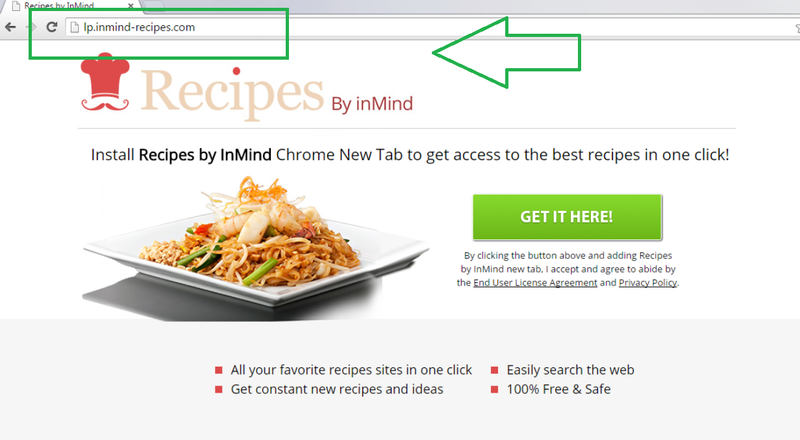 What do you need to know about Recipes By inMind New Tab? Recipes By inMind New Tab (lp.inmind-recipes.com) is listed as a Potentially Unwanted Application (PUA). If you use Google Chrome web browser, there is high probability that Recipes By inMind New Tab will change your start-up page and new tab. Even if you are Mozilla Firefox or Internet Explorer user, you should be aware of this undesirable program. There are no guaranties that the application will not find a way how to alter the previously mentioned Internet browsers as well. If you have noticed any modifications to your Internet surfers, you need to delete Recipes By inMind New Tab without any feeling of guilt. You should remove Recipes By inMind New Tab immediately for a couple of reasons that we will soon discuss in more detail. If you already know why the PUA does not deserve to stay in your PC, you can scroll down to the program’s elimination instructions. Nevertheless, we advise you to read the whole article because you can find valuable information on how to avoid similar issues there. MindSpark is the developer of Recipes By inMind New Tab infection. This makes the program even less trustworthy because the Mindspark company has created other suspicious software in the past. For example, Sports by InMind, Games by InMind or Music by InMind. Therefore, Recipes By inMind New Tab removal is important, if you do not want to get even more malicious software on your computer. How does Recipes By inMind New Tab alter my virtual machine? Most of the time, Recipes By inMind New Tab finds your computer’s system via bundled free of charge software. The Potentially Unwanted Program’s creators use the fact that many PC users simply skip all the steps from the installation wizard. Thus, you should pay more attention to the setup process. Also, you need to know that you can usually disable the questionable programs there. You may do that by selecting the Advanced installation mode. However, if the suspicious program has already found a way to the PC, you will need to remove Recipes By inMind New Tab as soon as possible. Another technique that Recipes By inMind New Tab may use to infect your computer is other adware applications. Programs such as Recipes By inMind New Tab usually travel together with other software. This means that you may soon find other unwanted programs in your electronic device as well. For this very reason, you should not waste any more of your time and delete Recipes By inMind New Tab once and for all. How to get rid of Recipes By inMind New Tab instantly and effectively? Without Recipes By inMind New Tab removal, your electronic machine has serious computer vulnerabilities. In order to restore your computer’s security, you will need to manually uninstall Recipes By inMind New Tab extension via Google Chrome. After eliminating the plug-in, you should perform a full system scan with free removal tool Wipersoft , to make sure that there are no questionable applications left in your computer. The good news is that once your malware removal tool is installed, you will no longer have to worry about similar threats. Your anti-virus program will protect the computer’s system from the irritating infections.